Crunchy kale and citrus salad with jalapeño and goat cheese, the perfect energy boost you need for the summer! Boost your energy with delicious crunchy kale! 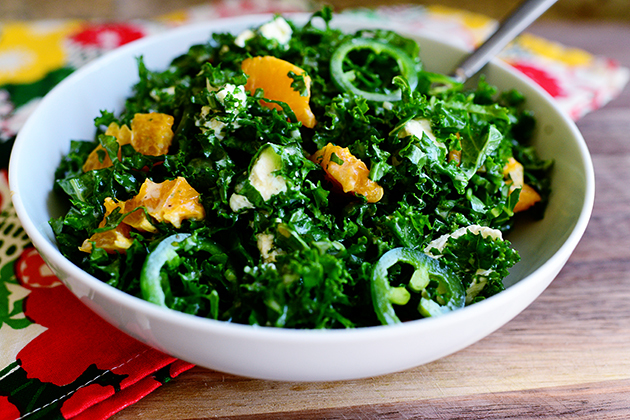 Crunchy raw kale, tangerines or clementines, jalapeño and goat cheese make a vibrant superfood meal! This time of the year I often crave for something earthy but refreshing, and the mix of kale and tangerines makes it happen! I found this recipe on "The pioneer woman cooks DINNERTIME", by Ree Drummond, and I think it's just perfect! Super easy and fast to prepare, you are guaranteed to impress your guests! 1- Start by prepping the kale. Rinse it well and dry it, then discard the stalks. 2- Working in bunches, roll up the leaves into a tight roll and use a sharp knife to slice it very thin. 3- Next, cut the ends of the jalapeño and use a sharp knife to cut really thin slices. Use a spoon to clear as many seeds out of the centers as you can, so that you mostly just have green circles. 4- Peel the tangerines or clementines, then slice them and cut them into chunks. 5- Add the chunks of tangerines or clementines, along with the jalapeño and the chunks of goat cheese to the salad. 6- For the dressing: pour the orange juice into a small jar. Grate or press in the garlic, add the olive oil, sugar , salt and pepper. Put the lid on the jar and shake vigorously for about 30 seconds. 7- Finally, add the sour cream or the Greek yogurt and shake again. 8- Dress and toss the salad, and you are ready to serve it!